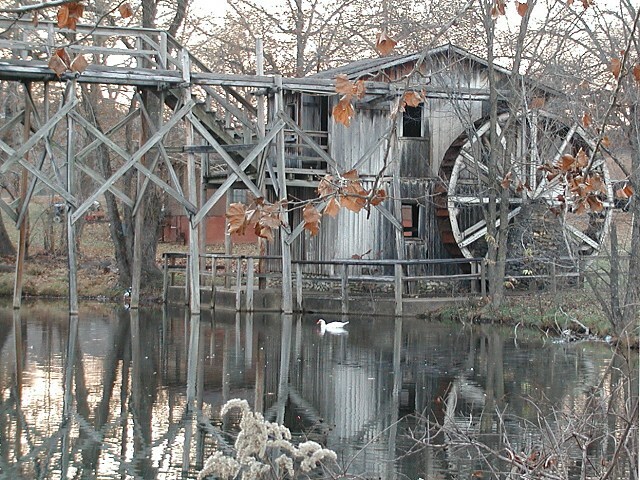 Taken at dusk, an old water wheel no longer needed except as a reminder of how people in the Ozarks once survived. Thanks for all the wonderfull comments. This is my first entry for the dpchallenge and I was shocked to see it come in second with all the great competition. I did very little to this photo, except to crop it a bit, and lighten/sharpen it a bit. I really don't don't like an overmanipulated digi photograph, but that's kind of just me, as I am primarily interested in outdoor/nature photography so like things as I see them as much as possible. I took it at dusk as I got to the site late, as I am a real procrastinator; although the grayed light worked out well for me. I had some other shots without the leaves, that had more of the water wheel reflection, guess I should have used one of those. Oh well, I am learning. I took it two days after I got my new Oly c-2100 UZ, and am still learning it. Again, THANKS, THANKS, THANKS, all comments were well taken. Great picture and title. This was high-tech at one time. Excellent work. nice soft look to that wood. I think a crop of the bottom would be a good idea. the branch only obscurrs the view, doesn't frame or enhance it.. Nice reflections and weather emphasizes the mood. Pefect title -- photo colors to match. Wonderful image. The calm waters and the leaves add to the calm mood of the picture. Great exposure and composition you took a beautiful photo. beautifully taken, one of my favorites this week. Wow, what can I say. Just a great photo. Print it and frame it. A 10 from me. Best of class. Great Idea only problem is the tree brance in the way. Does not add to anything but displeasure. What an absolutely beautiful photograph! If it snows where this was taken you have to go back and photograph it again. I love the lone white duck in the picture too. Wish I had a poster of this one. This is just a very nice picture all around. Very tranquil and serene late autumn vibe. The shot of color from the leaves is excellent. Rarely do I give a 10, and this got one from me. A beautiful picture and perfect for the challenge. My favourite this week - a lovely shot. get those ugly branches out of the way. I like the cold look to this. Looks good. Great photo! The brown leaves in the forground add a small but important amount of color (as does hte swan). Really nice picture. Great pix! !Had to comeback and upgrade this one. 9 Digipixer. nice choice of a subject. love the old stuff. It looks like you were shooting toward the sun here, so the quality of light is all the more remarkable to me. It's a very good composition with lots of good detail but it's the atmosphere that grabs me. So far, it's in my top five. Tremendous. GREAT SHOT I CAN FEEL THE CHILL IN THE AIR JUST LOOKING AT IT !! amazing color, or lack of it. this is great! I also like how the mill blends so well with the surrounding forest. Nice scene. Shame the wheel is hidden so much. Proudly hosted by Sargasso Networks. Current Server Time: 04/22/2019 12:02:51 AM EDT.